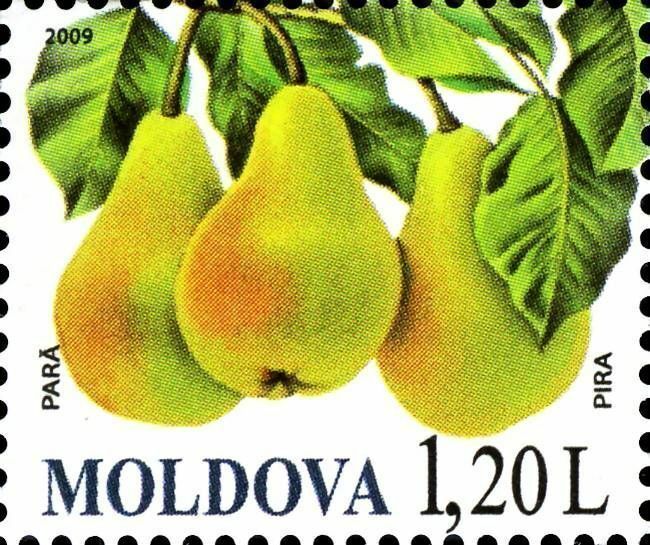 On 28 August 2009, the Post Office of Moldova (Poșta Moldovei) issued a series of postage stamps with the title Fruits. The issue comprises four stamps, with associated cancellation (postmark) and first day cover (FDC). The designer was Oleg Cojocaru. The printing was performed by Tipografia Centrală, Chişinău. A walnut is an edible seed of any tree of the genus Juglans, especially the Persian or English walnut, Juglans regia. Broken nutmeats of the eastern black walnut from the tree Juglans nigra are also commercially available in small quantities, as are foods prepared with butternut nutmeats from Juglans cinerea. Read more.. 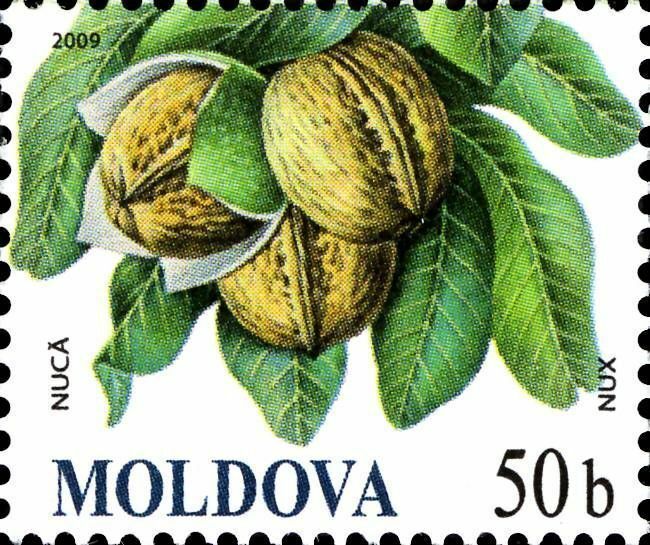 This article uses material from the Wikipedia article 'Walnut', which is released under the Creative Commons Attribution-Share-Alike License 3.0. 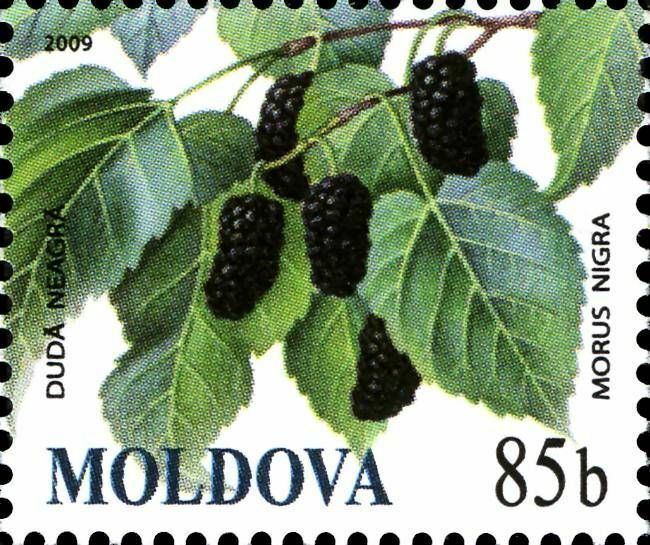 Morus nigra, the black mulberry, is a species of flowering plant in the family Moraceae, native to southwestern Asia, where it has been cultivated for so long that its precise natural range is unknown. It is known for its large number of chromosomes, as it has 154 pairs (308 individuals). Read more.. This article uses material from the Wikipedia article 'Morus_nigra', which is released under the Creative Commons Attribution-Share-Alike License 3.0. The pear is any of several tree and shrub species of genus Pyrus /ˈpaɪrəs/, in the family Rosaceae. It is also the name of the pomaceous fruit of these trees. Several species of pear are valued for their edible fruit, while others are cultivated as ornamental trees. The genus Pyrus is classified in subtribe Pyrinae within tribe Pyreae. Read more.. This article uses material from the Wikipedia article 'Pear', which is released under the Creative Commons Attribution-Share-Alike License 3.0. An apricot is a fruit or the tree that bears the fruit. 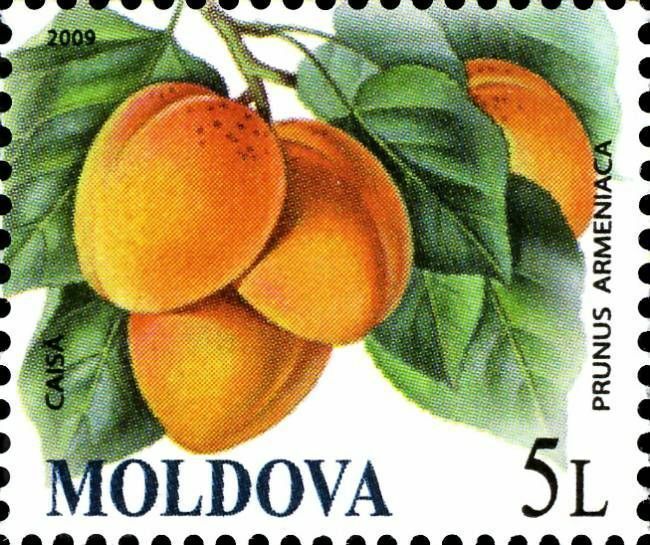 Usually, an apricot tree is from the tree species Prunus armeniaca, but the species Prunus brigantina, Prunus mandshurica, Prunus mume, and Prunus sibirica are closely related, have similar fruit, and are also called apricots. Read more.. This article uses material from the Wikipedia article 'Apricot', which is released under the Creative Commons Attribution-Share-Alike License 3.0.